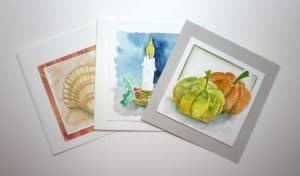 Home » Painting Holidays France » Paint your own Christmas card – easy and fun. The picture on the left shows a selection of some of the card designs you can paint. It couldn’t be easier. No talent or technical know how is required just a few paints, a brush, some watercolour paper and a sense of fun. Just imagine how much money you will save and how impressed your family and friends will be to get an ‘original‘ work of art. Don’t forget to sign it! This is just one video tutorial from my on line painting course. Click on the title and get it for $15 instead of $40, but only until December 17. That gives you plenty of time to get painting. Previous PostHow I teach and the creative process. FREE course – My 5 most useful tips to give your painting a head start.